Bring subjects to life with the authentic voices of those who shaped the world. Britannica Original Sources contains the original documents and personal accounts of humankind’s social, political, legal and religious development, as well as some of the greatest discoveries, insights and literary achievements in the words of the actual authors, discoverers and knowledge-seekers. Our vast collection gives students access to an extensive, authoritative and growing collection of over 420,000 e-works of classic, primary source, and general reference materials. Ideal for those preparing for exams, sources can be tailored to the national curriculum and to focus on helping children meet exam boards’ requirements. 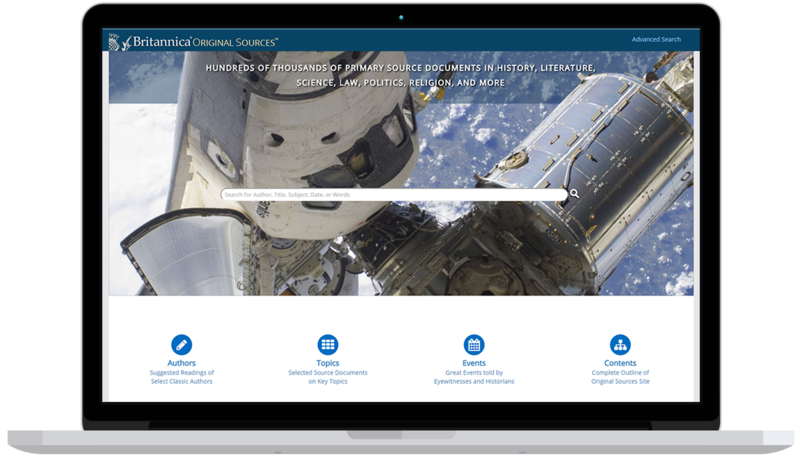 Including Charlotte Bronte, Charles Darwin, Karl Marx, James Joyce and Winston Churchill, Britannica Original Sources provides children with direct access to first-hand accounts from those at the centre of events.